"…Journalists and PR professionals, the influence brokers of traditional media, have lost a huge degree of influence on the web in large part because they don’t link to anything. While traditional media brands are still powerful channels on the web, they are losing influence everyday to the link-driven web network — journalists and PR professionals can no longer depend on controlling these former monopoly channels to exert influence online." Now think about what happens after the click. After someone has used Google to search for something and clicked on a high ranking link thinking, it had the relevant content they were looking for. Instead, they find themselves on a site loaded with links and "keywords" offering no value whatsoever. Turns out that the only reason the site exists is not to provide value, or content, or information—but in fact to show up in the search engines. It was carefully engineered for that sole purpose. It's how some marketers will choose to combat the power of the link. They'll fight fire with artificially produced flames. Of course what they don't realize is that they are doing exactly what their marketing forefathers have taught them. They are fooling the "customer". Or are they? What happened to tried and true marketing techniques? We began to resent them. Avoid them. Tolaerate them—but just barely. Marketing became noise and so we bought DVR's and iPods to tune it out. So the marketers shouted, became more clever, put marketing in places we never expected. And some, though not all really only care about what happens before the click. If you click—they've done their job. Or have they? What happens after the click is just as important as what happens before. Maybe even more. It's an opportunity to inform, inspire, engage, and enable. In the best case scenarios—it can bring a brand to life and take relationships to the next level. Or, it can cause suspicion, mistrust and frustration. All because the metric of the click meant more than anything else. So yes, there are ways to compete with the "new influentials". There are tricks, gimmicks, shortcuts and clever work-arounds. You can measure the success of it all. What's harder to measure is the long term impact it has on your reputation—especially if you underestimated how resourceful your customers can really be. What happens after the click can be a moment of truth for any business. It's an opportunity to do something something most others don't—to do something meaningful. Or you can take the easy way out—and just be happy they clicked. A short term strategy if I ever heard one. 3. Spend nearly 10 minutes trying to figure out how to drain it. 4. Get frustrated, beat yourself up for being an idiot and finally give up. Whenever the subject of hotels comes up—I'll probably share my experience with the unusable sink. I can see the story becoming an instant classic with other travelers who will share their own horror stories. But it underscores a simple and profound message. People don't just share good experiences—we share bad ones too. In fact, we're even more inclined to talk about the bad ones. There's something therapeutic about it. Experiences are like apples—and it only takes a single bad one to taint the rest of the batch. Every business wants to be talked about—they just don't want it to be about their unusable sinks. "Do I really wanted to be associated that closely with the Ad industry?" "How many opportunities do you get to evangelize your beliefs"? See—though I talk a good good game about the industry we call "advertising"—the reality is that I've never considered myself a product of it. Go through my resume and you'll find that the bulk of my personal experience lies in Web design, graphic design—even broadcast design mixed with 3+ years spent as a information designer embedded in the newsroom. If course I've worn many hats—interaction design as one of them and have done my share of conceptual wireframes, flows and the like. I never touched an Ad in my life. Which is precisely the irony behind the feature. Consider the interviewer—Brian Morrissey from Adweek is one of the few industry journalists who is genuinely active on multiple social platforms including Facebook and Twitter. In fact—that's how we met and it's mostly where we interact. Brian also blogs about running. He's one of us. Or at least—I consider him to be. So maybe the best way to look at all of this is to realize that traditional "Ad Guys" no longer exist. Nor do "traditional journalists". Well—they still do, but in a world moving at light speed—it's getting more difficult to draw firm lines between what's considered Advertising, marketing, or just good business. Maybe we're all accidental "Ad Guys and Gals"
Or maybe we're all just accidental marketers. "This downturn will be a perfect storm for the agencies. Many are not properly geared up to deal with the digital age especially the very big names. Ogilvy’s announced to cut 75 jobs from its NY headquarters (around 4% of total workforce). Most of cut comes from Ogilvy One which is the DM and interactive arm. Yes, it has always been treated as an “arm” and there were never any vision of serious investments in it. Their largest clients including Dove (they did some good work for them) and IBM are moving money to branded content and digital initiatives. Anyway they were never considered a key player in the digital world." "Service businesses run on talent, and when those services involve the Internet, technology or data and marketing analytics, that talent is in extraordinary high demand and expensive. Digital marketing may not command the lion’s share of ad spending today, but it will at some point in the not-so-distant future. This means investing in that talent now, knowing that it won’t fully pay off until the future. Obviously, this is hard to do in digital media buying, since the margins are so thin and the projects aren’t always very scaled, but that is the cost of market entry. Of course, it may mean using geography as an advantage. Some of the hottest ad agencies today are not in one of the traditional media metropolitan markets. The Martin Agency is in Richmond, Va. Crispin Porter is in Miami. Wieden Kennedy is based in Portland, Ore."
These are all recent articles written by credible sources. So what's going on? Well honestly if I even tried to answer that question, this post could easily turn into a white paper. 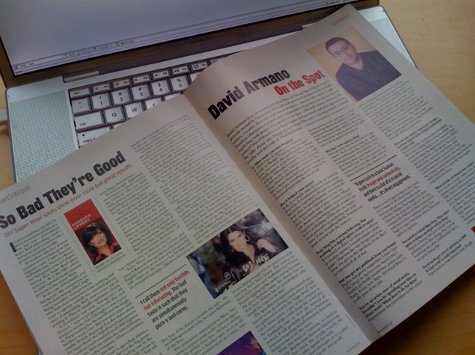 But for what it's worth—here are a few issues I see with the industry. Call them challenges—call them opportunities, but I believe that we're seeing a serious shift in an industry that at it's core has not had a lot if incentive to adapt. Until now. Agencies focused on profit alone may find themselves shrinking as they continue to chase dollars. Without investments in infrastructure that can thrive in digitally enhanced environments—agencies who rank revenue as priority #1 may end up with short term gains and long term losses. From what I can tell, agencies are still rewarded for their creativity—only the industry's definition of creativity is narrow. Clever, "viral" campaigns —special effects and the art of good editing/directing command the attention of the people who hand out the awards as well as the press. It's no wonder agencies put so much pressure on their staff to win awards even if it means producing something that has zero value to the average user. I looked through the portfolios of the "hottest" agencies of 2008. Guess what the majority of work made up those portfolios? Yup—flashy micro sites, clever campaigns and ubiquitous banners. There are glimmers of hope. Crispin Porter who practically invented the "clever viral" category with their infamous subservient chicken recently designed a site for Dominos Pizza which features a visually simple interface that allows users to customize their pizza and then order it a local store (ones that support the online customization anyway). Take away the ordering part and the effort might still win an award—and that's part of the problem. As Joseph Jaffe eluded to—some agencies still don't exactly have the healthiest or most financially rewarding environments—this may have been fine in the past, when copywriters and art directors considered anything outside of an agency to be a dead end for their career. For digital talent it's different—digital people including designers, developers and content strategists can find challenging work on the client side or start up and it's not seen as a bad thing. If some agencies don't fix their culture problems—they may find themselves with talent who look the part but don't actually play it. This is an area I know least about. But I've worked at several agencies with starkly difference billing structures—and I always seem to come across articles that raise this as an issue. Seems to me that agencies need to get a better handle on how to bill out their resources in a way that doesn't cause as much client confusion. Why build from scratch when you can use Wordpress as a CMS, Basecamp as a collaboration tool and Concept Share as a way to co-create. Now is a great time to dig into the already existing platforms (in addition to existing social networks). While building from scratch has it’s place, there are more options than ever to tap into a service that just might do the job. Consider skipping mass TV all together. It worked for BMW films and with YouTube firmly in place—it can even work with less production values and high priced talent. Consider ways to make the participant the star. TV has kind of sucked lately anyway since the writers went on strike. Don’t know about you—but my TV consumption has gone from slim to nearly none. Read full post at Experience Matters. I'm thinking about visual thinking. I'm not the only one. Next week, the first of it's kind conference on visual thinking is kicking off in San Francisco. It's called Vizthink. If you are in the area and interested in the topics of design thinking and synthesis—I suggest you go. I wanted to, but the timing didn't work out. "Thinking in pictures, is one of a number of other recognized forms of non-verbal thought such as kinesthetic, musical and mathematical thinking. Multiple thinking and learning styles, including visual, kinesthetic, musical, mathematical and verbal thinking styles are a common part of many current teacher training courses.Visual thinking has been found to be the most common thinking style, accounting for up to 60%-65% of the general population"
"As dyslexia is believed to effect up to 17% percent of the population and Visual thinking is predominant in around 60%-65% of the population, there is no clear indication of a link between visual thinking and dyslexia. As visual thinking is the most common mode of thought, it might be expected that the incidence of visual thinking in the dyslexic community would be reflective of that in the general population, around 60%-65% of each population." "Visual thinkers describe thinking in pictures. As approximately 60%-65% of the general population, it's possible that a visual thinker may be as likely as any human being to also have good spatial-temporal reasoning or visual spatial ability without the two having any necessary direct relationship. Acute spatial ability is also a traits of kinesthetic learners (those who learn through movement, physical patterning and doing)"
Interesting? Indeed. So, as you've probably figured out by now—I'm a visual thinker. I'm also a very specific kind of visual thinker. The way I approach things is to look for a few choice nuggets of an abstract concept and I focus on those using ultra simple visuals to help communicate the idea I am looking to expand on. I also leave a great deal open for interpretation. My visuals are thought starters. Catalysts. They are meant to instigate further thinking. They usually do. There are all types of visual thinking—from complex diagrams that lend themselves to info graphics to simple visualizations of ideas and thought. In a digital age of complexity—I forsee visual thinking as playing a key role in business—an effective way to get people to understand complex problems and begin working on solving them. I view visual thinking as a tool. A versatile tool that could fall under the catagory of design thinking. As you can see by this post, I've created a new category here as this is something I hope to be writing more about. Stay tuned—more to come. Here we go again. Just when I was getting into a groove—life kicks in and lets me know that it has other plans. Late last week it was announced that I was getting a significant promotion. It's probably the most important in my career thus far, as I'm making a leap from leading teams to leading an entire department of over 40 people. And you know how I feel about departments. I'm not taking it lightly. It's a serious vote of confidence and I had to think about it for a bit before pursuing. I'll now be accountable for the collective creative product that gets produced out of the Chicago office of Critical Mass. Yikes! But sometimes you have to go back and dig up the things you believe in. You have to ask yourself—"am I willing to do what it takes to make this a reality"? So I went through some materials and found this in a document I had helped write. "At the end of the day, we’re focused on relevant, groundbreaking solutions that fuse style and substance—insight driven creative, supported by technology, which ultimately leads to measurable results. Not merely flashy creative or fleeting viral campaigns, but rather, applications that shift consumer behavior, brand experiences that deepen customer relationships and game-changing strategies that meaningfully impact the bottom line." I honestly don't know. But how will you ever uncover the answers to any question if you never try to find them? We are living in an age of ambient interruption. Gone are the days when we flipped through channels while Ads interrupted our programming. Broadband, wireless and file sharing killed the radio star and all our media is served to us on a "need it now" basis. We think we need it? We go out and get it. We've been liberated to ignore the assault on our senses telling us to buy, asking us to try and selling the myth of brand. So it's ironic that the new form interruption now comes from our peers. It's pervasive, subtle and ambient—it surrounds us at all times and manifests itself in various forms of technologies and devices. Another point of irony is the notion of permission marketing. Yes, it worked for a while—in fact we gave permission to brands and friends to engage us in what we thought were meaningful relationships. Permission marketing was born and thrived—and still does. But look at how we behave in our daily routines. Step out of your body and watch yourself over your own shoulder as you work your computer, and check in with your smart phone. We've given our friends and favorite brands permission to "interrupt" us, through e-mail, text, IM, social networks—you name it. It's not a bad thing. Actually, it's quite empowering. But you have to wonder if it's become another form of interruption. It's ambient interruption—we can actively pay attention, or ignore it. What happens when we reach critical mass for the volume of ambient interruption that we can handle? For each of us, it's different. We cope in different ways and use various techniques to filter. 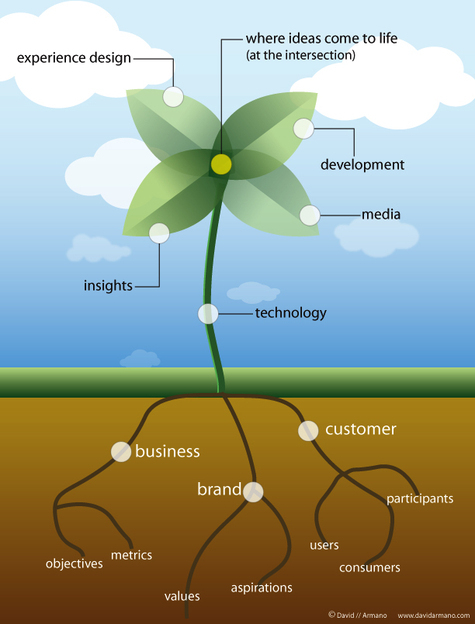 In the end, it's up to us to manage as our personal media environments continue to evolve. Sometimes I wonder if we'll become cynical about it—just like we did with the original interruption model. Guess we'll find out. I really need to update my blogroll—it's been frozen in time due to my inability to do twenty things at once. But I've always admired Grant McCracken's blogroll which assembles some of the most interesting blogs in one place. If you are looking for new sources of inspiration—consider Grant's list a resource. Sachlichkeit. 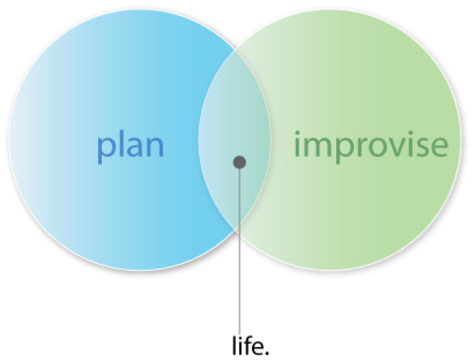 a blog on the intersection of design+management+life. "I have seen great information on parts and pieces of experience design - for example, Pine and Gilmore's book "Experience Economy" does a great job of exploring experience generally - but really doesn't touch on digital experiences. Other books are great at helping us improve the user experience on web apps... but miss the broader picture of experience. I'm hoping to show how these three areas - structure, community, and customers - are really part of the whole digital experience." Structure – Creating better experiences by improving a Web site's ease-of-use. Great customer experiences happen when customers can focus on their own goals, rather than on how to navigate your site. Community – Memorable experiences are created via online participation and community. Learn how to start conversations with blogs and wikis, as well as how to use podcasting and videocasting to create a personal touch. Ideas to jump-start conversations are provided. Customers – Finally, you will learn how to stage experiences online, with practical tips on turning negative experiences into memorable ones. "It’s been said that experience is the product, yet few books go deep into the subject of digital experience design. That’s because since Gilmore and Pine’s seminal book titled “The Experience Economy” practitioners and academics alike have debated what the notion of experience actually is. It’s time to move beyond debate toward action. Experience Design in all its forms is a driving force of modern day economics. Basically the average consumer, user or individual has become spoiled and as a result demands superior experiences and if they don’t get one—they go elsewhere. Digital has changed everything. While we still marvel at Apple for it’s lustful product design—we spend countless hours engaging in all types of digital activities from the Web to mobile and beyond. As a result the lines between interface, design and engineering all blur into a single question: “did I have a good experience or not”? It’s pointless to debate the differences between Experience Design and Digital Experience Design—what’s far more productive is to understand the difference experience makes in the everyday lives of human beings. Digital Experience Design is not a fad, nor a buzz phrase, nor yesterday or tomorrow’s topic—it’s a reality that all businesses and brands have to contend with. People will judge your products, services or brand itself by the experiences they have with it. 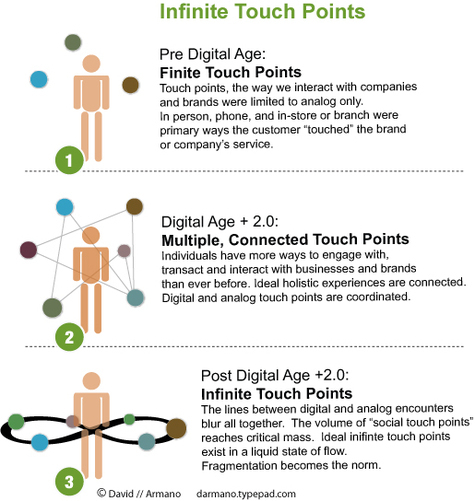 Just happens that much of this will occur across multiple digital touch points. Every time we engage with a company service or brand in a digitally enabled way—we’ve experienced the art and science of Digital Experience Design. There are literally thousands of practitioners working in this field whether they know it or not. The hallmarks of any successful digital experience is simple. Happy customers, people and users. It’s time for us to get serious about Digital Experience Design. Part marketing, part product and all experience—it’s what will provide a competitive advantage in a digital world inhabited by empowered individuals." "The Ego Epidemic in advertising is ridiculous. This is one industry - probably because it's idea driven - that is high on ego and self-righteousness. How many times do people take credit for someone else's idea? How many times do people add in comments to briefs/in a client meeting just because they want to be heard? How many times are people wrong and just don't say "Oops, didn't mean to do that?" "Spamturitis" is the combination of too much spam combined with too many features. 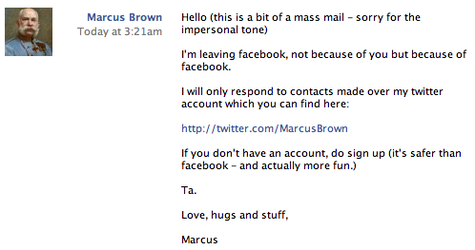 If you look at the above note from Marcus Brown—you can see he's had enough of Facebook. Not sure if it was because of Spamturitis, or some other reason—but I can tell you that I can relate to the valid criticism of Facebook which is that your friends can turn into spammers and sometimes it feels like the Web application has just too many things you can do with it. If Marcus were to look at his social solar system, then Facebook has become the equivalent of Pluto. Many of us are re-thinking what social applications have a better signal to noise ratio. Personally, I still like Facebook and find it useful—but I'm considering turning off some features that clutter my inbox (like Super Wall). 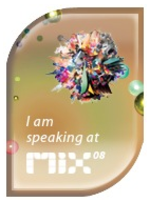 For me, 2008 is all about increasing signal and reducing noise. Anyone else feeling the same way? Or differently? You didn't need a visual to get the not-so-subtle message sent to both parties in Iowa. But while we're at it, we might as well face the reality that this one word may define the future of the world's largest superpower. And while the candidates try their best to use the word to their own advantage—the prize will most likely go to the one who actually embodies it. Change. It's just a word. I got married young—age 24 to be precise. In a couple of weeks, we'll raise a glass to toast year 12 of our time spent as husband and wife. But it might have never been if we didn't spend a little time apart. Not that we broke up—but we did spend a summer in different states. By the end of that summer, after substituting e-mail for touch—we realized that distance had indeed made out hearts grow fonder. And sometimes I feel the same way with blogs I read regularly. Those who leave blogging for a while only to come back to it with a passion make me realize how much I missed it while it was gone. Some choose to get others to fill in for them while they are gone (it's not the same thing). Nothing wrong with this—but there's something about a favorite blog that goes away—only to come back bigger and better that makes me realize how much I appreciated it in the first place. No one can replace the personal brand of you. If it's valuable—we'll come back with stronger feelings than ever. If it was a relationship of convenience, chances are we'll forget about each other and find something else to fill the void. Distance can make the heart grow fonder—or it can end the relationship. Either way, it's a road-test on a street named loyalty. And that's a two-way road to everywhere.